High school students in the KC HealthTracks program are spending time at MCC’s Health Science Institute learning about health-care careers. For instance, they play various roles (such as doctor, nurse, family member) while caring for patients with cardiac and respiratory issues. In a big classroom in the Health Science Institute at Metropolitan Community College, high school kids sitting at long tables are being welcomed before the day gets officially underway. “You will have the opportunity to learn from the best and the brightest,” promises Dr. Cheryl Carpenter-Davis, dean of instruction at MCC-Penn Valley, which includes HSI. 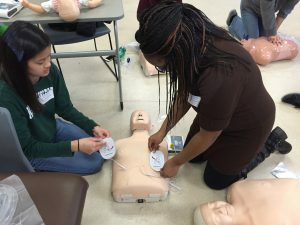 These 40 or so students from nine area high schools, mostly freshmen and sophomores, are not just bright – they’re also interested in careers in health care. Or at least they might be by the time this program, called KC HealthTracks, is over. HealthTracks is not, however, a one-and-done thing. Instead, it will bring the same group of students – or “cohort,” in education-ese – together at least twice each year while they’re in high school. This “pipeline for the health professions,” funded by the U.S. Department of Health and Human Services’ Office of Minority Health, is aimed at students from “under-resourced” local high schools. At school, the HealthTracks participants are enrolled in Project Lead the Way, a biomedical sciences curriculum. To become a HealthTracks participant, students had to be invited by their teacher and then complete an application according to Martha McCabe, KC HealthTracks program director (and executive director of KC STEM Alliance). Each high school could recommend five to six students. 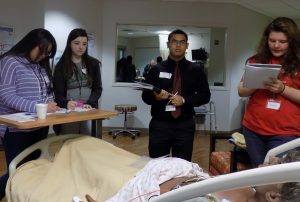 A good chunk of the students’ HealthTracks training will take place at MCC’s Health Science Institute, but they will also visit hospitals and other workplaces, and get math and science tutoring and help with ACT test prep. Incoming juniors will attend a summer camp at UMKC. Learned Heartsaver CPR on mannequins of various sizes in an EMS lab. Learned how to prep for surgery and assist a surgeon in the operating room, skills required to be a surgical technologist. 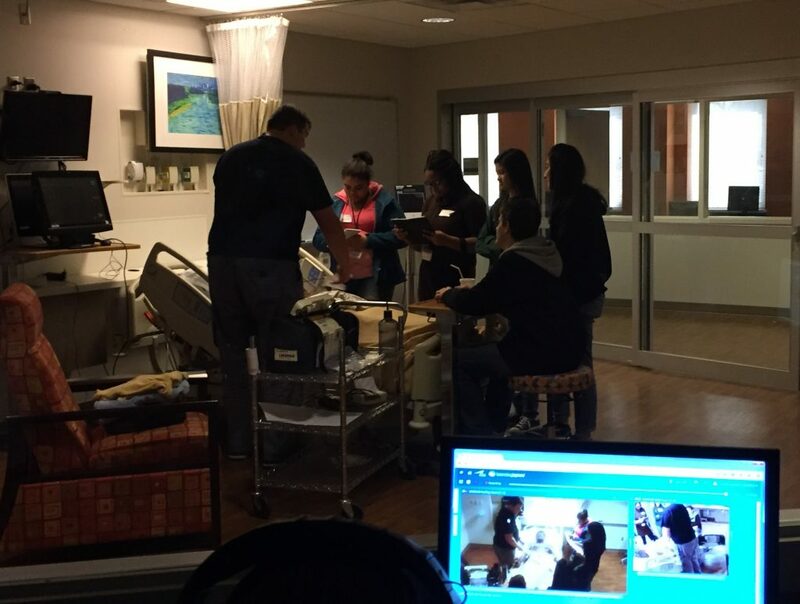 Played a variety of roles, from doctor to nurse to family member, while caring for patients with cardiac and respiratory issues in the simulated environment of the Virtual Hospital. Afterward, when asked to evaluate the day, students gave the HealthTracks experience at MCC an overall 4.81 out of 5 points. How to work a surgical camera. I learned the Heimlich maneuver on a baby. The difference between technician and technologist. Really important to wash hands when doing a surgery. The $2.5 million federal grant covers five years. Each year, a new group of 40 freshmen and sophomores will be added. A total of 200 students over the five years will benefit. From MCC’s perspective, the hope is that many of these high school students will choose to attend college here. This year’s participating high schools are Fort Osage, Grandview, East (Kansas City Public Schools), Truman, William Chrisman, Van Horn, North Kansas City, Oak Park and Winnetonka. Center and Ruskin will join this fall for years 2 – 5. Carpenter-Davis says MCC is pleased to be in partnership with KC STEM Alliance on this project. 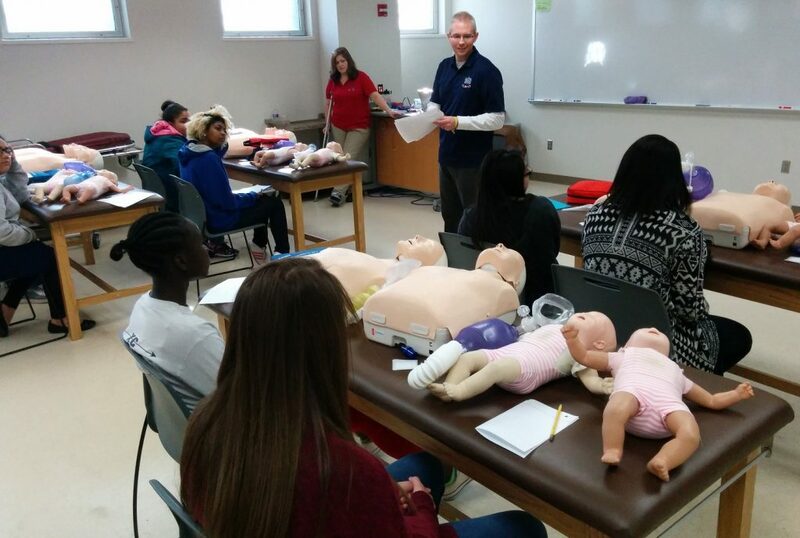 Chad Wright, EMS education program coordinator at MCC, welcomes HealthTracks students to the Heartsaver CPR class.